« Possible Arrival of a Galactic Superwave within the Coming Months? I propose that this emission originates right in the solar neighborhood, that this emission is radiation from a very old supernova remnant called the North Polar Spur (NPS), which has been estimated to be up to 1 million years old. The NPS is believed to be the remnant of a supernova explosion that occurred about 425 ± 250 light-years away, hence about 55 times closer to us than the Galactic center. Since the energy requirement for this feature would scale according to the cube of distance, this implies that the energy content should be reduced by 180,000 fold. Hence rather than having an energy equal to 105 to 106 supernovae, the outflow energy would rather fall in the range of that produced by a single energetic supernova explosion. Also instead of having a velocity of 1000 km/s, this material would have a more modest velocity of 18 km/s consistent with an old supernova. The center of the NPS supernova explosion has been placed at Galactic longitude 330° (hence 30° to the right of the Galactic center in the above galactic map) and at a latitude about 18° above the galactic plane. 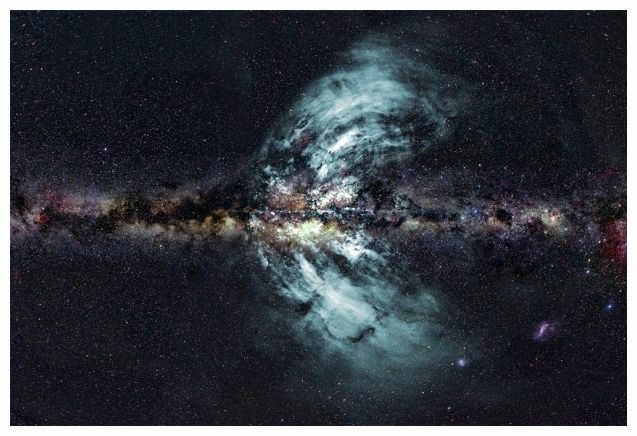 As seen, the CSIRO “outflow” structure is centered to the right of the Galactic center and it has a curved contour reminiscent of a spherical supernova remnant. In fact, if we look at the Jodrell Bank 408 MHz image of the North Polar Spur, we find that the two make a very good match especially at northern latitudes; compare the NPS image below with that shown above. Jodrell Bank radio telescope image of the North Polar Spur made at a radio frequency of 408 MHz. 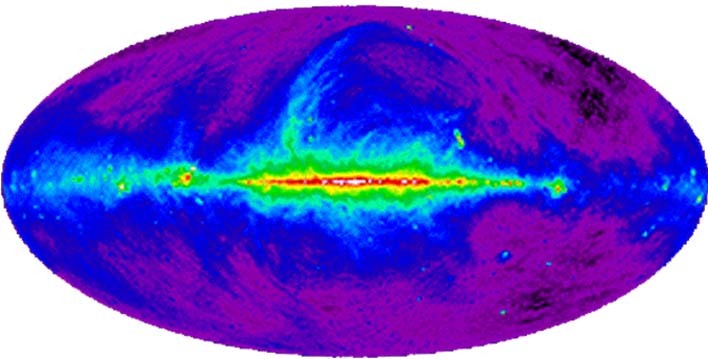 If the CSIRO feature were associated with the galactic core, we would not expect the lobes to be skewed to the right as they are shown in the top radio map. Recall that the Fermi bubbles extend outward in a direction that is perpendicular to the galactic plane.